Hi, I am Teddy. Once you read this you cannot get out. Finish reading this until it is done! As I said, I am Teddy. I am 7 years old and have no eyes and blood all over my face. I am dead. If you don't send this to 12 ppl, I will come to ur house at midnight and hide under ur bed. When ur asleep I'll kill you. Don't believe me? Case 1 Patty Buckles got this email. She doesn't believe in chain letters. Well, foolish Patty. She was sleeping when her TV started flickering on and off. Now she's not with us anymore. Haha Patty, haha. You don't wanna be like Patty, do you? Case 2 George M Simon hates chain mail, but he didn't wanna die that night. He sent it to 4 ppl. Not good enough George. Now George is in a coma & we don't know if he'll ever wake up. Haha George haha! Now, you don't wanna be like George do you? Case 3 Valarie Tyler got this letter. Another chain letter she thought. She only had 7 more people to send too. Well, that night when she was having a shower she saw Bloody Mary in the mirror It was the BIGGEST fright of her life. Valarie is scarred for life. Case 4 Derek Minse. This is the last case so I'll tell you about it. Derek was a smart person. He sent it to 12 people and found a $100.00 dollar bill on the ground. He was promoted to head officer at his job and his girlfriend accepted his propose. Now Katie and him are living happily ever after. They now have 2 beautiful children. Send this 2 12 ppl or you'll serve the consequences. 0 - you'll die 2ight; 1 to 6 - you'll get injured; 7 to 11 - you'll get the biggest fright of ur life; 12 and over - ur saved and will have a great fortune. Do what Teddy!!!! Hurry!!!! Send this to 12 ppl before midnight 2night!! Hey There! It's Me Shaneko9002! Hows it goin? Can anybody Bare to challange or look at this DeadMan? 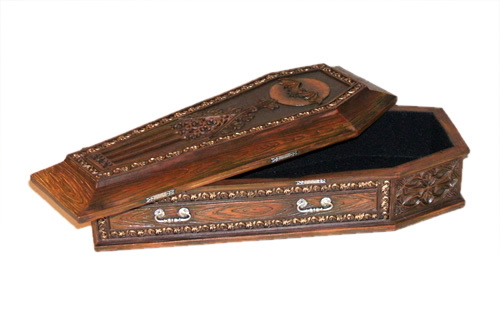 "You know you cant run from me...Your Coffin Awaits you...Dont be afraid...This wont hurt....much"